For decades, large companies have been wary of corporate venturing. So why are more and more smart companies going VC to find their next breakthroughs? With corporate R&D units under pressure to focus on a narrow range of projects, companies often lack a good way to sniff out competitive threats beyond their main areas of expertise. 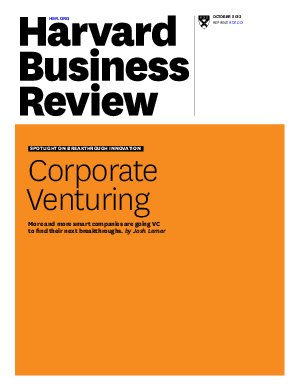 A corporate venture capital fund for investing in outside startups can help a company see, understand, and respond rapidly to changes in the business landscape. But the parent company’s processes tend to bog down these funds. Discover how successful companies are avoiding that problem in this Harvard Business Review article by HBS Professor Josh Lerner, faculty chair of the HBS Executive Education program Private Equity and Venture Capital. You’ll learn how to create a venture fund that can be as savvy and nimble as the best private VCs by limiting fund goals, providing competitive compensation, and establishing systems for knowledge transfer.